Why do brussels sprouts get such a bad rap? My guess is too many people have had a bad brussels sprout experience with mushy, overcooked, bland ones. I mean seriously, they are possibly one of my favorite vegetables. I compare the flavor to broccoli, just with a smoother texture. And being a member of the cabbage family means that they are going to absorb the flavors of your seasoning really well. Typically I roast my sprouts with garlic and olive oil until the tops are brown and caramelized. But with all of our recent grilling adventures I decided to track down a new preparation method. This recipe hit the nail on the head right away. The blanch ensures that they are no longer tough to eat but it’s quick enough that they are not over cooked and mushy. Then the tossing in that fabulous seasoning? Are you kidding me, match made in heaven. I love the unexpected flavor from the celery seed. Then there’s the grilling, the outside starts to turn a fabulous golden brown that really concentrates the flavor. Really really fabulous. 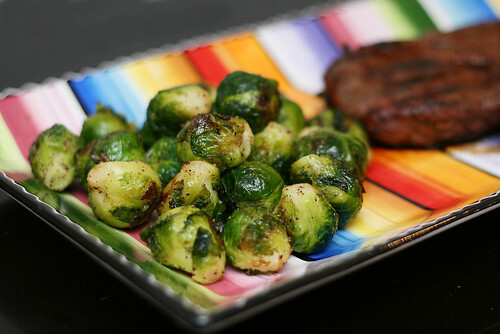 So please, STOP HATING ON THE BRUSSELS SPROUTS and try this recipe. Fill a large saucepan with water and bring to a boil. While the water is coming to a boil, clean and trim the brussels sprouts. Add the brussels sprouts to the boiling water and blanch for 4-5 minutes. Remove the sprouts from the water and drain off any excess liquid. Place the coated sprouts on the grill (if you need to, you can lay out a piece of foil so they don’t fall through) and cook over medium-high heat for 12 minutes, turning the sprouts every 4 minutes. Remove the sprouts from the grill and put back into the heatproof bowl. Toss with the seasonings one more time before serving. >Brussel's sprouts were on Manager's Special and after seeing these photos on WC this morning, I knew I had to get them. YUM!